Bilberry plant, Vaccinium myrtillus, is also known as European Blueberry and Whortle-berry. Eye health and night vision is supported by the consumption of Bilberry. Reputed to slow the development of cataracts, glaucoma and macular degeneration. Berries are astringent and antibacterial. Tea of the leaf is reputed to lower blood glucose levels and be useful in the treatment of diabetes. Produces a strong purple dye. 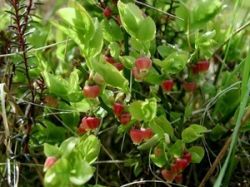 Bilberry plant is native to the heaths, moors and woods of Europe. Adaptable to most acid soils in a protected, partially shaded position. Frost resistant but drought tender. A perennial woody shrub, growing to 0.6m x 1.0m. Pinkish flowers produced in spring and summer, followed by small, edible reddish fruit that ripen to a bluish black. Be the first to review “Bilberry, plant” Click here to cancel reply.